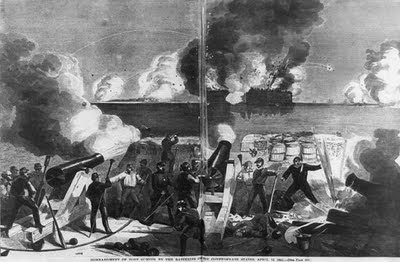 Today is the 150th anniversary of the Confederate bombardment of Fort Sumter, which began the American Civil War. It's semi-well known that for the bloodiest American war ever fought, the opening salvos were bloodless.... Well, technically. Two Union soldiers died after the surrender of the fort: one of Major Anderson's conditions for the surrender was to be permitted to fire a 100-gun salute to the US flag before lowering it. A spark landed in one of the piles of cartridges next to the guns (strange laxness for an experienced artillery officer like Anderson!) and killed Private Daniel Hough, mortally wounding Private Edward Galloway. A stranger incident occurred shortly before that, as recounted by Shelby Foote... Before the surrender was negotiated, the first casualty was when Roger Pryor of the Confederate truce party mistook a bottle of iodine for water, and had to be saved with a stomach pump by the fort's surgeon.